One of my favorite releases presented in such an elegant package. Does anyone have any info on a white vinyl version of this album? It doesn't have anything printed or inscribed in the run off area and I cant really find much out about it. Any info would be greatly appreciated. Thank you. Track 4th (Das Model) appears on side B and not Side A as written on notes, seems to be a missprint on this unofficial release. Very clear and crisp sound. The mastering is perfect and I highly reccomend anyone to get a hold of this pressing. Does anyone know how many of the red edition exist? Why are the english and german versions of this record mixed up and not easy to find out in the market place overview? 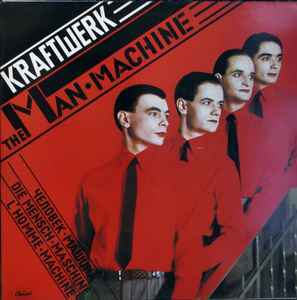 Man-Machine is an interresting part of Kraftwerk's legendary discography. It ditches their famous funky rhythms, the only album to do so in fact, in favour of very simplistic, minimalist, robotic and almost machine-like 4/4 rhythms (save for Man-Machine, the only song ironically which uses more of a funk beat). The melodies are also a lot more repetitive and machine-like, giving the album a very futuristic feel to it. I remember buying this album in the early 2000's and being awestruck by how modern it sounded, refusing to believe it was made in 1978. And for its time, this album was insanely ahead of its time, sounding like NOTHING else at the time. Kraftwerk's pure industrial sound on this record is probably what makes it my favourite and in my opinion they never made any album like it before or since. Every single track explores the future of mankind, whether it would be through robots of our own creation, exploring space, future society (dystopian or utopian is never made clear, but Metropolis and Neon Lights evokes images of Blade Runner for sure, years before it was made), as well as technology merging with humanity in the title track, a notion that evokes images from the later cyberpunk movement. The only track which seems a little dated was ironically one of Kraftwerk's biggest hits, The Model. It feels a little bit out of place on the album, but it serves as one of their best pieces of electropop nonetheless with a look at the (sometimes willing) objectification of women. All in all, Man-Machine is probably one of Kraftwerk's strongest albums and while it was easily overshadowed by Computer World which in my opinion is a much stronger concept album, it still holds a strong second place for me. Another concept album about mankind evolution. As time goes by, we are using more and more machines to the detriment of our jobs. We are really robots. A visionary release from this famous pioneer and electric group called Kraftwerk.